NEW YORK--(ENEWSPF)--26 July 2010 – Three decades after nearly 2 million people perished under Khmer Rouge rule in Cambodia, a United Nations-backed tribunal issued its first verdict today, finding the former head of a notorious detention camp guilty of crimes against humanity. Sentenced to 35 years in prison by the trial chamber of the Extraordinary Chambers in the Courts of Cambodia (ECCC), Kaing Guek Eav, whose alias is Duch, was also found guilty of grave breaches of the 1949 Geneva conventions and sentenced to 35 years in prison by the trial chamber of the Extraordinary Chambers in the Courts of Cambodia (ECCC). The first person to stand trial before the court, he headed the S-21 camp, also known as Tuol Sleng, where numerous Cambodians were unlawfully detained, subjected to inhumane conditions and forced labour, tortured and executed in the late 1970s. “He worked tirelessly to ensure that S-21 ran as efficiently as possible and did so out of unquestioning loyalty to his superiors,” according to a news release issued by the ECCC today. 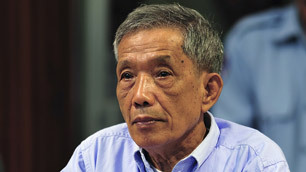 The trial chamber found that Mr. Kaing not only implemented, but also actively contributed to the development of the policies of the Communist Party of Kampuchea at S-21. Estimates vary but as many as two million are thought to have died during the rule of the Khmer Rouge between 1975 and 1979, which was then followed by a protracted period of civil war in the impoverished South-East Asian country. In deciding on a sentence, the ECCC said that it took note of several factors, including the gravity of the offences. Although prisoner lists from S-21 show that at least 12,272 people were detained and executed, the trial chamber believes the number of victims is considerably larger. The chamber also decided on a finite sentence instead of life imprisonment due to the defendant’s cooperation with the ECCC, his admission of responsibility and the potential for rehabilitation, among other factors. Mr. Kaing’s sentence will be reduced by five years due to his illegal detention by the Cambodian Military Court between 1999 and 2007, and he is already entitled to credit for time already served. During his trial, which began in March last year and wrapped up in November, 24 witnesses, 22 civil parties and nine experts were heard. More than 28,000 people followed the proceedings from the public gallery. The ECCC, established in 2003 under an agreement between the UN and Cambodia, is tasked with trying senior leaders and those most responsible for serious violations of Cambodian and international law committed during the Khmer Rouge rule. It is staffed by both Cambodian and international employees and judges. The court’s co-investigating judges may issue a closing order, or indictment, against four leaders of the Khmer Rouge regime – Nuon Chea, Ieng Sary, Ieng Thirith and Khieu Samphan – later this year. In April, it dismissed appeals by three of them for release from provisional detention ahead of their trials.